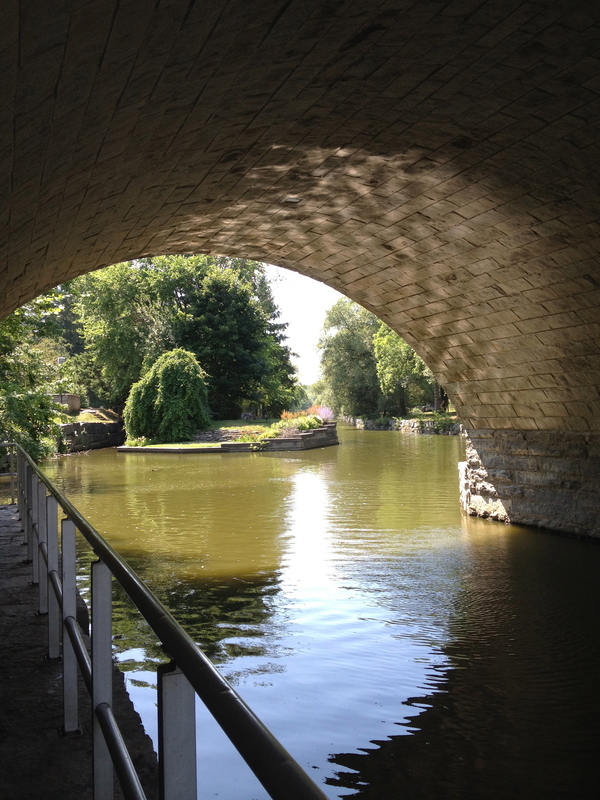 While at first glance Stratford, Ontario may seem like any small, historic town in North America, it has a lot to offer the traveling walker. For those used to city life, Stratford moves at a slower pace, but it won’t disappoint in the way of world-class entertainment and restaurants. 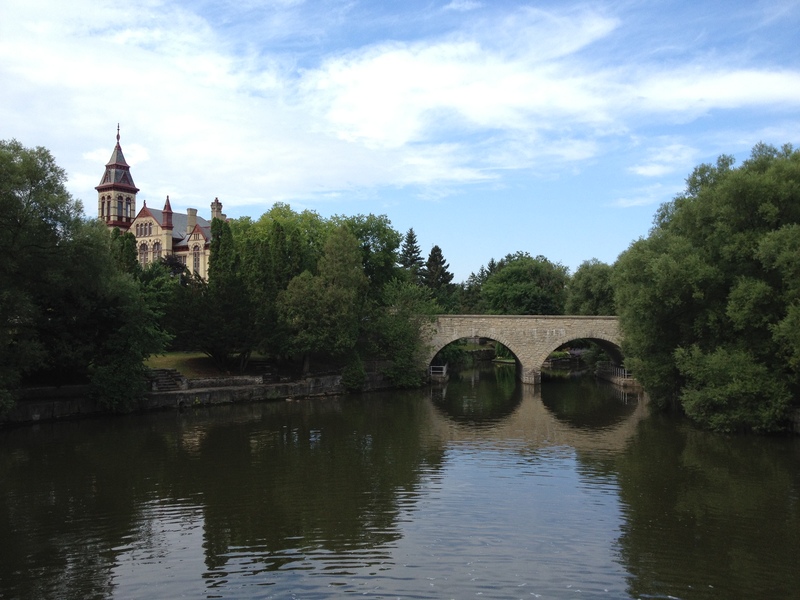 For the tourist who likes to walk and see the places they visit, Stratford is perfect as well, offering many walking tours, excellent paths to stroll along the river, a long street for shopping, and several gardens to explore. 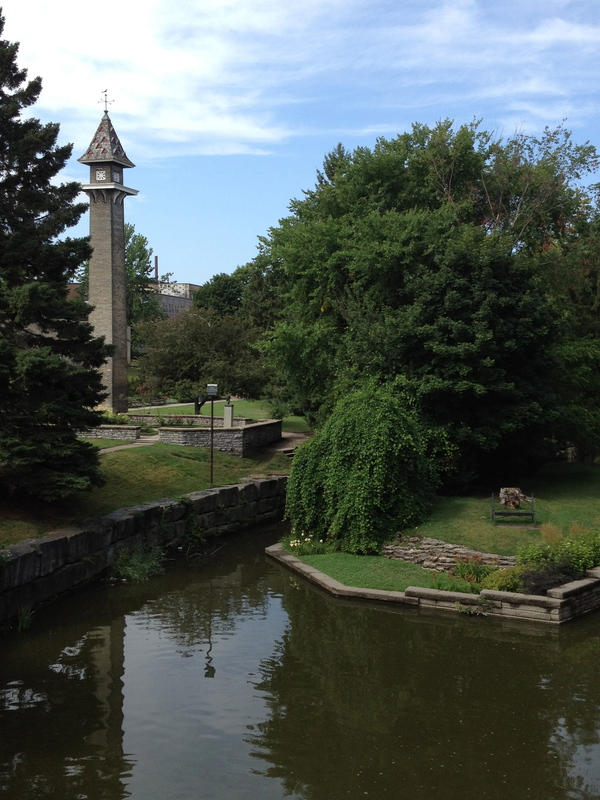 Stratford, Ontario is about a two-hour drive from Toronto or a three-hour drive from Detroit. Although Detroit is an hour longer, crossing the border by car seems to be quicker than going through customs at the airport in Toronto. From Phoenix, prices for flights are cheaper to Detroit than they are to Toronto as well. Still, Toronto is a fabulous city with all its own reasons for visiting, so make sure to choose to visit Toronto, either on its own, or as a path to Stratford sometime. To enter Canada by flying into Toronto, US citizens need to have their passports. To drive up from Detroit, you must have either a passport or the US Passport Card. If you read my previous article, you know we stayed at one of my favorite places in the world, The Verandah, a vacation rental owned by Debbie and Denis Harrison who rent out one side of their duplex home and live in the other side. 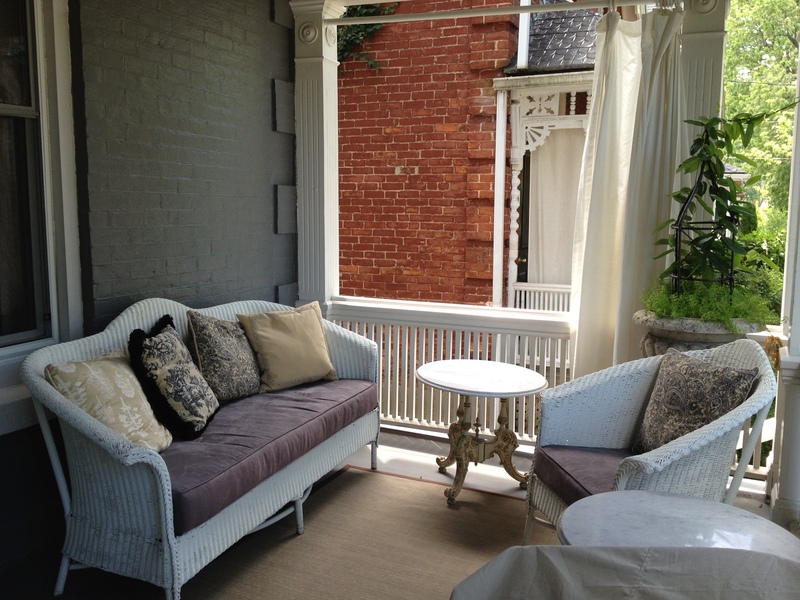 The Verandah is perfectly situated for anyone wanting to visit Stratford mostly on foot. We were able to walk to all the theaters and restaurants from our home away from home. In fact, the only place we didn’t walk to was the grocery store, which was just a tad too far for carrying loads of groceries. The Verandah has two bedrooms, both with queen-sized beds, and one-and-a-half baths. It has a full-size kitchen filled with glasses, dishes, pots, pans, and utensils–pretty much anything one might need to cook at home. There is an office with a large desk for those who must work while in Stratford, and they have high-speed wireless internet. For those times when you need to wash a load of clothes, there is a washer and dryer on site. For more images of The Verandah, go to my previous article. All distances and step calculations mentioned below are measured from the front door of The Verandah, which is located at 29 Church Street. If you’re staying in Stratford for any length of time and you have a kitchen available, you may wish to visit one of the many farmers markets or local food marts to take advantage of the fresh produce available in the summertime in Ontario. Thanks to groups like Slow Food Perth County, and others equally interested in eating locally and seasonally, there are several options available. Sunday Slow Food Farmers Market: This market is open on Sundays from 10am to 2pm during the summer months. Be sure to check with them online for their schedule, as they close when temperatures start to cool down. 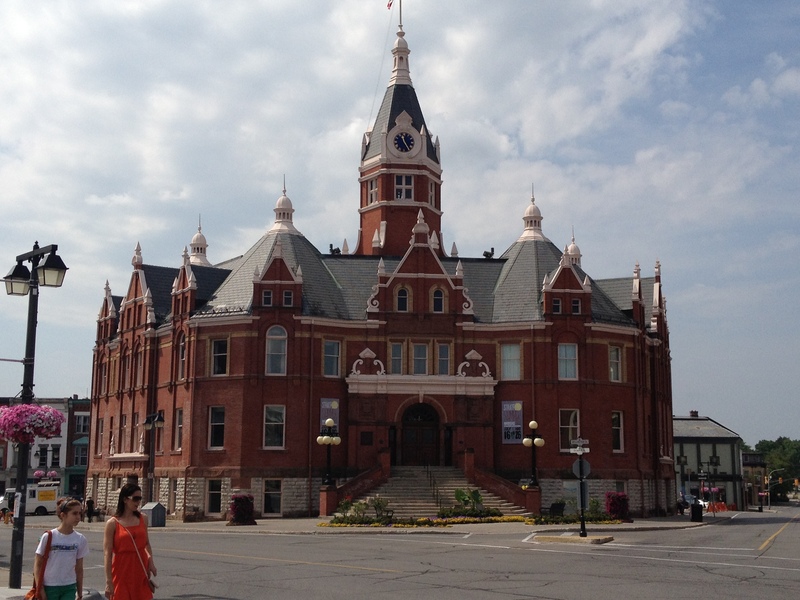 While they are in operation during the summer, they sponsor special events, including a Food Truck Event and a Pork Party, celebrating Stratford’s history with all things pork. The Slow Food Farmers Market is in the Market Square, just behind City Hall, between Downie and Wellington Streets. It is just over a quarter of a mile from The Verandah, making it about 600 steps one way. The Slow Food Farmers Market is located behind City Hall. (Look closely and you can see a food truck.) Take the road left, and you’ll come upon the Co-op. Take the road right and you’ll find the LCBO. Your Local Market Cooperative: This little grocery shop is owned and operated by the employees. Almost everything they sell is produced and/or processed in Ontario, the only exception being that their soymilk is from Quebec because they haven’t yet found a local producer. Breads are made onsite daily. Regular hours are Monday through Saturday from 8am to 8pm, Sunday 9am to 5pm. Located at 129 Downie Street, this store is .3 miles, or 600 steps, from The Verandah. The Gentle Rain Natural Health Food Store: This store has been serving Stratford for 30 years. They provide all manner of organic groceries, natural household products, supplements, and other items you may need to eat and live healthily. Their selection and variety is a little bigger than the co-op downtown, but both stores have the same desire of providing local, seasonal, healthy choices. Their hours are Monday through Friday from 9am to 7pm, Saturday from 9am to 5:30pm, and Sunday from 11am to 5pm. The Gentle Rain is located at 30 Rebecca Street, which is approximately .5 miles from The Verandah, or 1000 steps. Zehr’s: If you can’t find what you need at the farmers market, the co-op, or The Gentle Rain, Zehr’s will have it. This is your typical grocery store with a produce department, a frozen foods section, and a meat department. They have a variety of fish available, much of it local to Ontario, and they have a lot of familiar brands, such as Pepsi, Kashi, and Kellogg’s. They are open Sundays from 8am to 11pm, Mondays from 10am-4pm, and Tuesday through Saturday from 7am to 11pm. Zehr’s is located at 865 Ontario Street, which is not quite 2 miles from The Verandah. We did not walk there, but if you did, it would give you not quite 4000 steps one way. LCBO: Need a bottle of wine for a dinner party? How about some unique beer choices? The Liquor Control Board of Ontario, known as LCBO, is a store located just off of downtown Stratford. It has a very good selection of wines, beers, and other spirits. If you’re looking for something specific, go to their website before visiting the store. Select “Products” and do a search for the item, along with the store location, and they’ll provide an inventory of what is available. LCBO is located at 91 Wellington Street and is closed on Mondays, but open Tuesday through Saturday from 10am to 9pm, and on Sundays from 12pm to 5pm. To walk there from The Verandah will earn you about 400 steps one way. The store is .2 miles from your home away from home. Shoppers Drug Mart: For all those odds and ends that come up in a trip, there’s Shoppers Drug Mart. Similar to a Walgreen’s or CVS in the States, this chain store carries headache medicine, a variety of snack foods (including some fresh fruit! ), umbrellas, sunblock, and much more. They are open from 8am to midnight everyday. The one in Stratford is located at 211 Ontario Street, which is about .4 miles from The Verandah, or 800 steps one way. It could be that Stratford is one of my favorite places in the world because it is host to some of the best coffee I have ever had. Starbucks does not exist in Stratford, at least not downtown or within walking distance. At first this may seem as a disappointment, but once you get a taste of Balzac’s or Revels, you’ll be glad you didn’t have access to Starbucks. 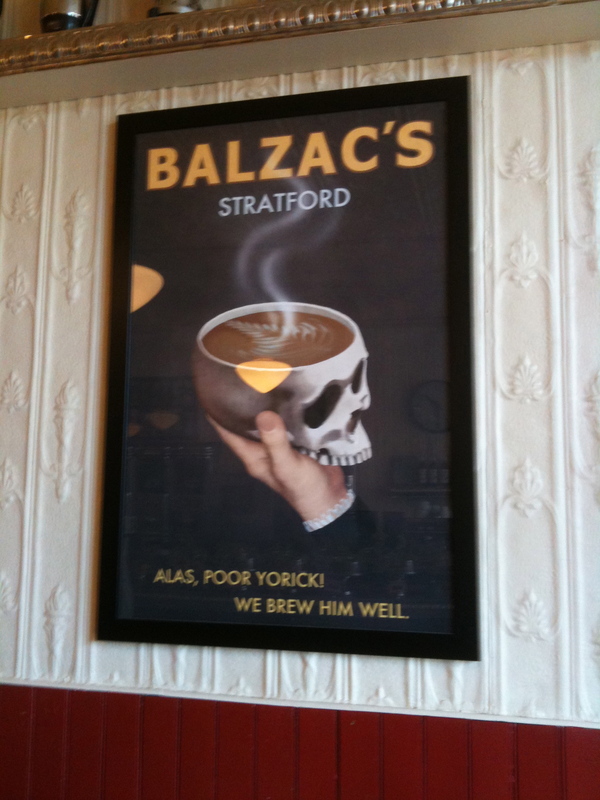 Balzac’s: This coffee house, which got its start in Stratford, has gone on to become a successful small chain throughout Ontario. Be sure and buy a pound or two of beans to stash in your suitcase so you can have a little taste of Stratford wherever you call home. I particularly enjoy the Atwood Blend. Balzac’s is a place to go lounge with friends. There is plenty of seating indoors and a few tables outside as well. If you are walking with a puppy, there is often water available for them just outside the door and they are allowed to sit on the patio with you. 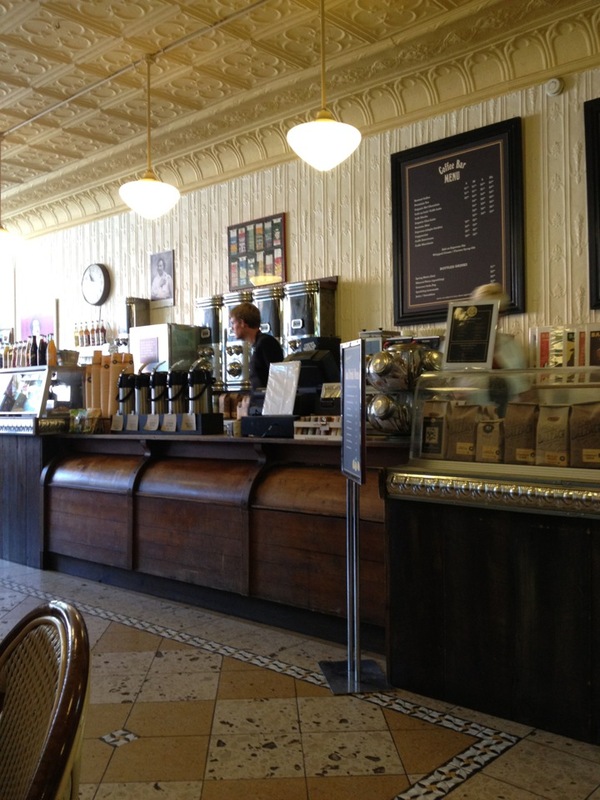 Sidle up to the counter for coffee drinks, beans, tea, and more. Hours are not listed on their website, but you may call them at 519-273-7909 for more information. In Stratford, they are located at 149 Ontario Street, which is .3 miles from The Verandah, or approximately 600 steps one way. Revel Caffe: Restaurants around Stratford agree, the coffee brewed at this coffee house devoted to fair trade is one worth experiencing. The rich roasts will make such an imprint in your culinary mind that, weeks later, you will think wistfully of the warm smell of the brew and the bold flavors. The owner, Anne Campion, will surely be part of that memory as well because she is passionate about her coffee and will happily talk with you to answer any questions you may have. While in Stratford, do as Steve McElroy from the New York Times did, and visit Revel Caffe often. Then, if your love affair has not been satiated, buy some beans to take home. You’ll be glad you did. Revel Caffe is open on Mondays from 8am to 5pm, Tuesday through Thursday from 8am to 6pm, Friday and Saturday from 8am to 7pm, and Sunday from 9:30am to 4pm. You can start your love affair by going to 50 Wellington Street, which is a mere .3 miles from The Verandah, or about 600 steps. Sputnik: This little coffee bar tucked inside the skinniest building in Stratford is also tucked beneath what is rumored to have been the apartment Thomas Edison lived in when he worked in Stratford for a short time. The coffee here is good, although Balzac’s and Revel are just a little bit better. Sputnik is just one of those places that immediately makes a person feel at home, like you’ve been going there for years, even if it’s your first time in. The baristas make Sputnik special, that and the mid-century atomic atmosphere. This coffee house is so small they don’t even have a website. They also don’t take credit cards, so be sure to take cash. For hours and more information, call them at 519-273-6767. Sputnik is just a hop from The Verandah at 46 Ontario Street, which is .1 miles away, or about 200 steps. 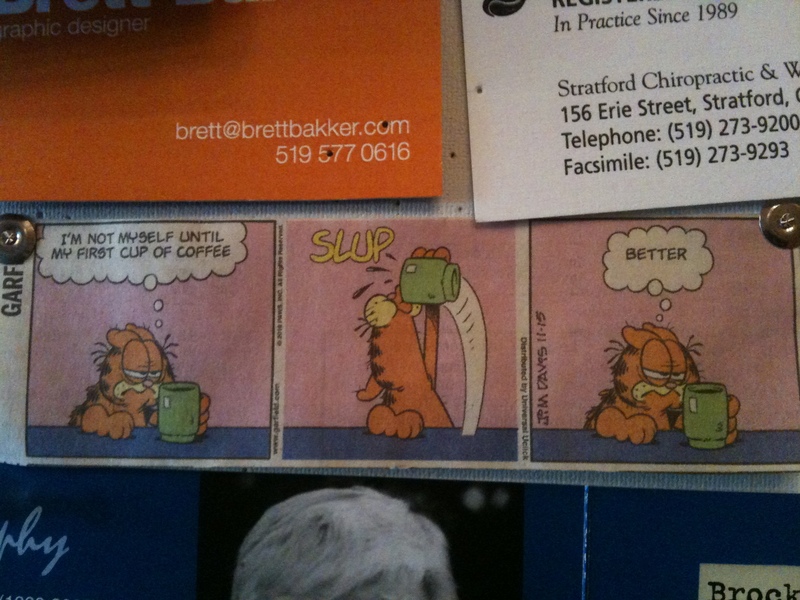 Saw this cartoon last year at Sputnik. It is applicable to me any day of the year. Thankfully, there are places like Sputnik all over Stratford to help make things better. For more information about these and other coffee shops in Stratford, visit the food blog, Kitchen Dilettante. It is important to note that many restaurants and shops are closed on Mondays in Stratford since the theaters are dark on that day. If they are open during the day on Monday, chances are good they will be closed on Monday evening. Be sure to check with the restaurant or shop for current hours. The (OLD) Prune: Long ago, this restaurant was called The Old Prune, hence the parenthesis and the word “OLD” in the middle. Some still call it that. I did for a while because it was The Old Prune the first time I went there. Whether it is old or new, this has to be the best restaurant in Stratford. And that’s saying a lot because you can almost throw a stone from anywhere in town and hit a great restaurant. The Prune, though, is extra special. If there is one place in the world where I am bound to not only eat every crumb off my plate for every single course, but also to threaten to lick the plate itself, it is The Prune. Having left you with that pleasant image, if you only go to one high-end restaurant in Stratford, make it The Prune. Calling all vegetarians: I know what you’re thinking. “If it’s that good, they probably make everything with duck fat and bacon.” Take heart, however. At The Prune, they offer an all vegetarian prix fixe menu. It’s true! And it’s all amazingly spectacular. Maybe that’s why this is my favorite restaurant. Reservations are recommended, especially if you have a show to go to. They can be made by calling 519-271-5052, emailing reservations@theprune.com, or online at OpenTable.com. Bijou: The experience at Bijou is tres unique, at least in this part of North America. It is not unlike a comfy bistro in Paris and the food is just as good (if not–dare I say it–better). A new menu is born out of the changing seasons and availability of local produce. Because it changes so often, the only menu available can be seen on a chalkboard right outside the kitchen window. The menu is prix fixe. Choose two courses for $48 or three courses for $55. Remember the vegetarian thing I mentioned earlier? Well, although Bijou does not always have vegetarian options on their menu, if you mention to the hostess while making reservations that someone in your party is vegetarian, they will go out of their way to prepare something wonderful for you. And it will knock your socks off. Reservations are recommended, especially for dinner. They are not open on Mondays but for the rest of the week they have two seating times for dinner. The first seating is from 5pm to 6pm. The second seating is from 8pm to 9pm. Call 519-273-5000 to make reservations and to ask about lunch hours. Bijou is located at 105 Erie Street, which is only .2 miles from The Verandah, or 400 steps one way. Pazzo Ristorante, Pizzeria & Bar: This two-in-one restaurant/pizzeria can be a little confusing, but it’s worth checking out both options during a trip to Stratford. The restaurant, which is located at street level when you first walk in the door, is for those times you’re dressed up for the theater and want something a little more upscale than pizza. The pizzeria, downstairs, is where to go when you’re a little more casual and just want to satisfy that pizza craving we all get now and then. You can dress up at the pizzeria too. Lots of people go there before a show, but whether you go to the restaurant or the pizza place, make reservations by calling 519-273-6666 or 1-877-440-9666. Pazzo is located in the heart of it all at 70 Ontario Street. This will earn you 400 steps, being that it is just .2 miles from The Verandah, so be sure and go to the restaurant one night and the pizza place another to get double the steps. Chocolate Barr’s: This chocolate boutique may not be a restaurant, but it is definitely gourmet and deserves to be highlighted. It is a perfect place to buy handmade (and delicious) gifts, along with the best dark chocolate I have ever had. For those on Weight Watchers, this is good news because dark chocolate is not only good for you but, when broken in to bite-sized pieces, only costs a Point or two. But there’s more good news! If you walk there from The Verandah, you can get around 600 steps one way! It’s located at 136 Ontario Street, which is about .3 miles away. Stop by for some chocolate, then walk across the street to Balzac’s for coffee. What more do you need? 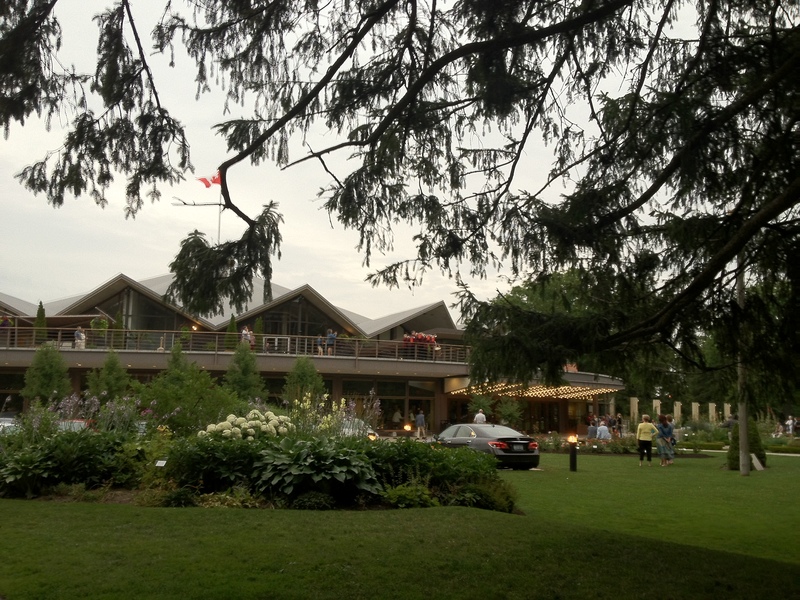 With 14 shows playing at various times in four theaters, many of which are populated by names you are familiar with if you watch any movies at all, the Stratford Shakespeare Festival will steal your heart and create a longing to return year after year. It is high-quality theater, but not highfalutin and pretentious. Tickets can be had for a reasonable price, some starting around $30 per person. Even if you can only do it once, the experiences had, the stories told, the emotions felt are unforgettable and will last you a lifetime. The Festival Theatre with its tent-like peaks. There are four theaters and a theater annex which house the different plays in Stratford. The Festival Theatre, is the largest theater in town. It is is located at 55 Queen Street. It is what gave Stratford’s theater festival its start. What started as a tent in 1953 is now a lovely building with tent-like peaks around its roof. The start of each show and the end of each intermission at The Festival is punctuated with the sounding of horns urging you in. It makes the event feel like an event from the very beginning. The trumpeters and drum call guests to the show from the balcony of the theatre. To walk to the Festival Theatre from The Verandah will earn you not quite 2000 steps since it is almost a mile away. Imagine what that will be like when you return to your home away from home with a total of 4000 steps, and the breath of fresh air you can breathe not having to fight for parking! 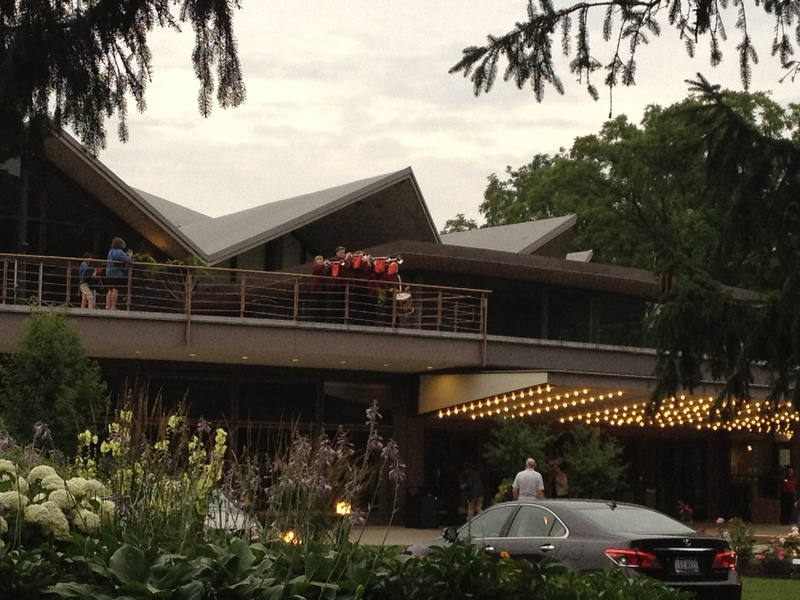 The Avon Theatre is a bit closer to The Verandah. It is located at 99 Downie Street and, so, is right around .3 miles (or 600 steps) one way. The Avon used to be a vaudeville theatre and then a movie theater, but in 1963 was bought by the Stratford Shakespeare Festival and made officially a part of the festivities. The Avon Theatre lit up at night. This was the night we saw Christopher Plummer in “A Word or Two”. The Studio Theatre and its Annex are not far from the Avon Theatre and, therefore, only add a few extra steps from The Verandah. It is located at 34 George Street East and is .4 miles, or about 800 steps from home. Both the Studio Theatre and the Studio Theatre Annex are more intimate spaces and are generally used for experimental plays and cabaret style shows. 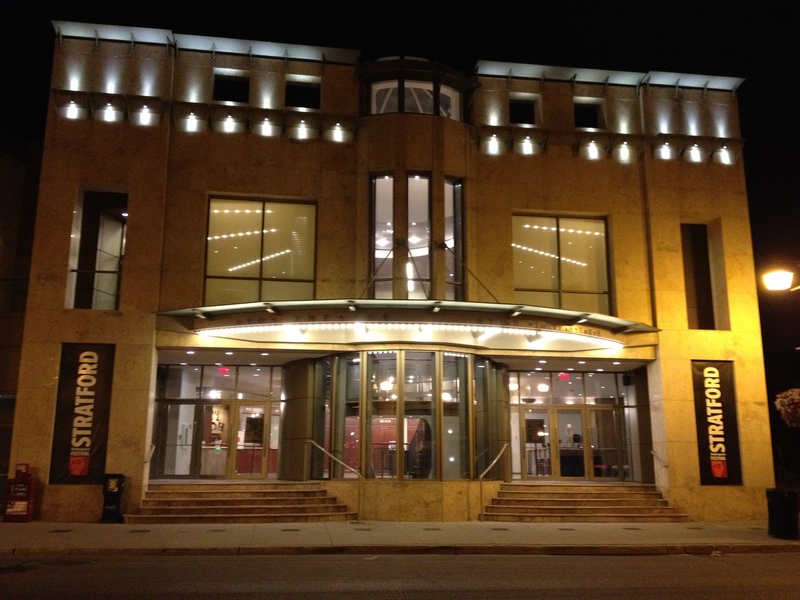 Finally, the Thomas Patterson Theatre, which is named for the founder of the Stratford Festival, is another intimate theater which showcases both contemporary and classic shows. In the last two years, I have seen a vivid telling of Shakespeare’s Titus Andronicus and an emotional Elektra by Sophocles, both of which could be argued as classic stories portrayed by the Stratford Creatives in very contemporary lights. This theater is located a half a mile from The Verandah at 111 Lakeside Drive. You can earn 1000 steps walking along the lovely river to get there. 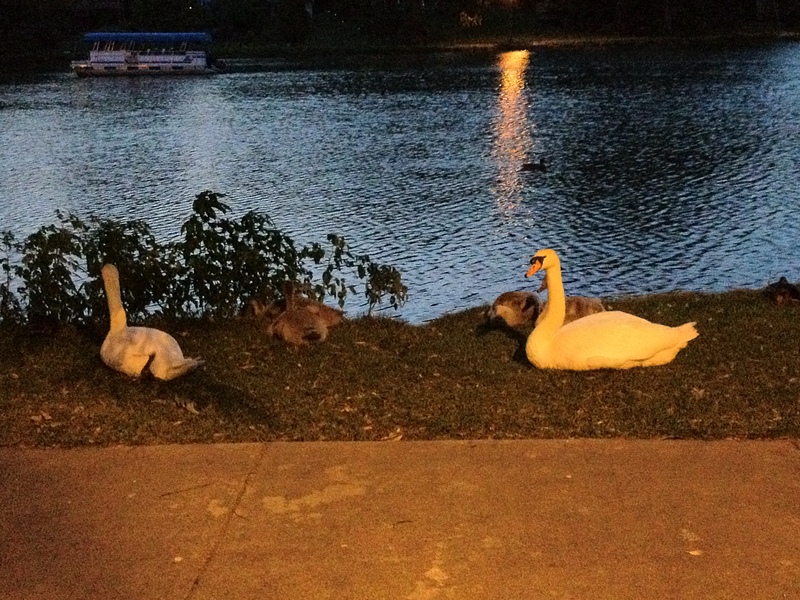 Walk along the river to the Thomas Patterson Theatre and you may catch site of beloved swans with their cygnets. If there is one thing I wish I had participated in more during my two-week stay in Stratford this year, it is the Stratford Summer Music Festival. All the locals I spoke to had been to at least one show and they all raved, especially about Jan Lisiecki, a young pianist who apparently put on an almost spiritual performance at St. Andrews Church. Truly, music seemed to pour out of every crevice in town, but unless it was right there, I seemed to miss much of it. It was a pleasure to walk along the river and catch one of the shows happening at the barge, and soon after I left, the Play Me, I’m Yours street pianos arrived for anyone to enjoy. Should you be a bit wiser than I am, go to Stratford during the the Summer Music Festival and soak it up, as well as the theater. Many shows and activities are free for the listening. You just have to be at the right place at the right time. I’m already planning for next year. One of the things that makes Stratford a walker’s paradise is the sheer number of walking tours offered through the Visitor Center. They have historical tours and architectural tours, garden tours and culinary tours. They even have a tour map for those interested in hitting all the favorited spots of local “It” boy, Justin Bieber, many of which are walkable around town. The Visit Stratford website is a bit difficult to navigate. There’s just so much to do in Stratford that it seems they’re having a hard time knowing how to organize the information. My advice is to go to the Stratford Tourism Alliance when you get into town and ask them for information about walking tours. Some are free, others are between $6 and $8, depending on who is hosting them. The Tourism Alliance, though, will have all the information you need. Their main office is located at 47 Downie Street, or you can call them at 1-800-561-7926. There is also a small Visitor Centre located along the river, just beyond the Veterans Memorial plaza. You can also do a small amount of searching with the free Visit Stratford app for your iPhone or Android phone. Although I couldn’t locate the free walking tours on the app, I did see information for all the places mentioned in this article, including The Verandah, restaurants, and other points of interest. It’s a good place to start. The Avon River has some sort of magical, hypnotic powers. When walking along the meandering paths, a person can’t help but forget that time exists. All other pressures are massaged out of the shoulders and brain, thanks to the gentle roll of the water, the golden light of the sunset, or the fluttering leaves of the lazy trees. Add to that the bagpipes wafting from the Veterans Memorial plaza or the dixie music playing off the barge, and time definitely stands still. 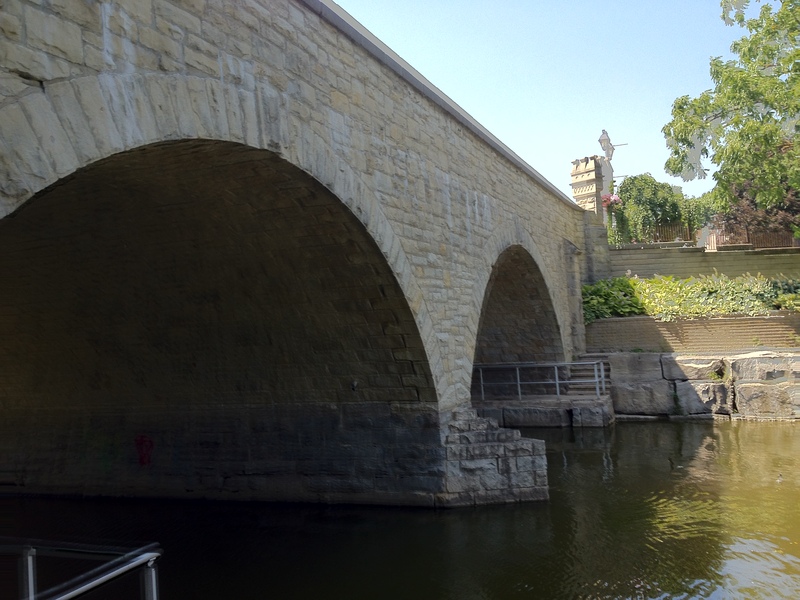 The Avon River, the stone-arch bridge, and the courthouse are three icons of Stratford. Cross under the stone-arch bridge to get from one side of it to the other and you’ll experience a picturesque view you only thought possible in England or France. 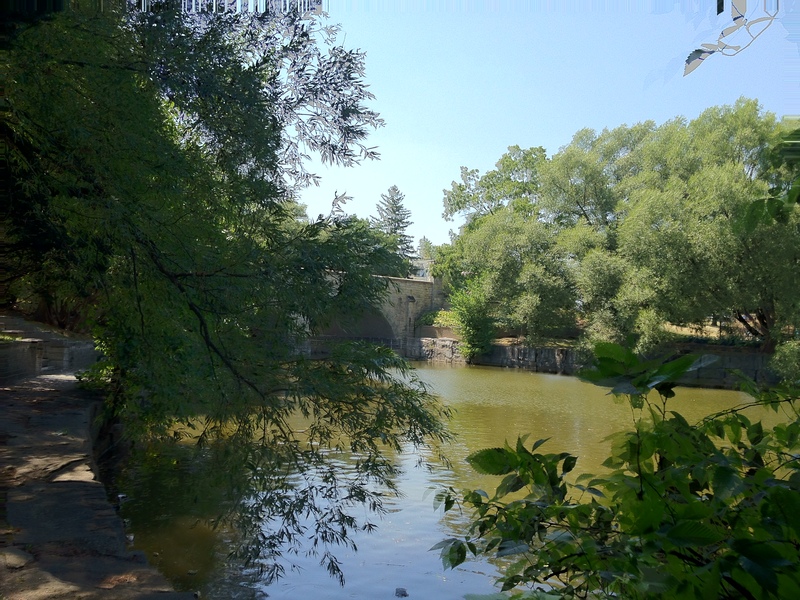 This is the oldest stone arch bridge still in use in Canada. Walk under the bridge for a different way to The Shakespeare Gardens. 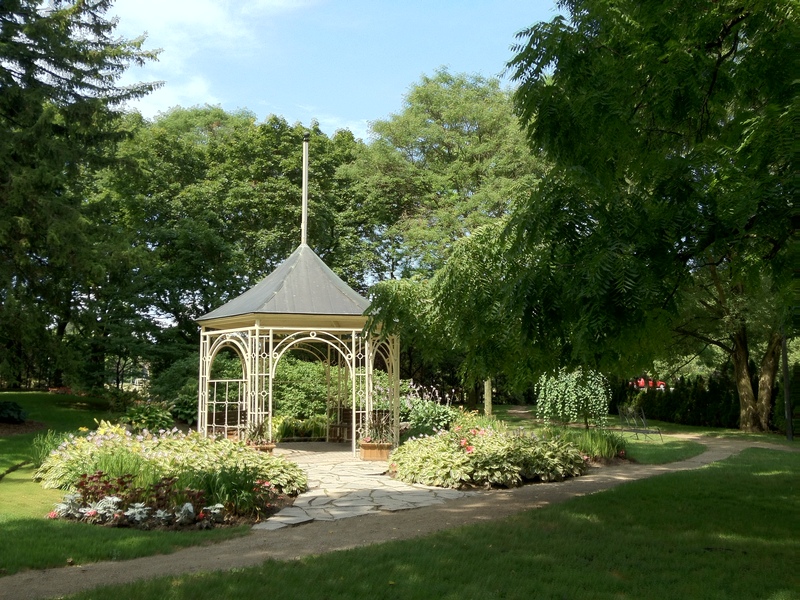 Once on the other side of the bridge, take in the Shakespeare Gardens. Be sure to walk all the way past Anne Hathaway’s house and the little gazebo. The trees grow tall and provide comforting shade on a hot summer’s day. The Shakespeare Gardens sit right next to the Avon River. Keep walking the path past the gazebo, into the trees and back around again. This article only scratches the surface when it comes to what to see, do, and eat in Stratford. That’s why it’s a good idea to visit as often as possible, so you can see and do that much more the next time. Have you been to Stratford? If so, where did you stay? What advice would you give someone going there? Do you have any questions about Stratford, The Verandah, or walking around town? Leave your questions and ideas in the comments section below. I look forward to hearing from you on one of my favorite subjects!